This is a traditional kusudama. I don’t know the name and the book didn’t mentioned it. 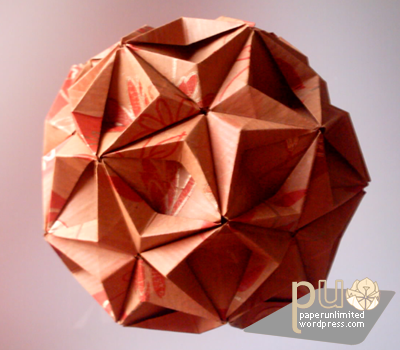 It’s a pretty kusudama that requires 30 units. Easy to fold, hell to assemble. You may need to resort to paste materials on the outside to help it to gain shape; after assembly no gluing is required, the model is very stable. This entry was posted on 2007|03|16 at 21:27 and is filed under kusudama, modular origami. You can follow any responses to this entry through the RSS 2.0 feed. You can leave a response, or trackback from your own site. I made this model a few days ago. It took me about 4 hours. It turned out really great, but I had to use several paper clips to hold it together durring assembly.